Implementation – Music is delivered as part of our Citizens of the world Curriculum. It is our aim that all children will develop a love and appreciation of music through playing instruments and singing; listening and appraising; and performing and sharing. We want all children to know they are musical beings and to give them opportunities to find their musicality. As soon as children start nursery they learn to sing and sing to learn. They count, learn shapes, colours, days of the week, develop their phonics, sequence familiar stories and learn about the world around them through songs and actions. This learning journey will be built on and be enhanced throughout their time in EYFS. Our younger children are given opportunities, both teacher-led and through continuous provision, to explore the elements of music with hands on experience of musical instruments. 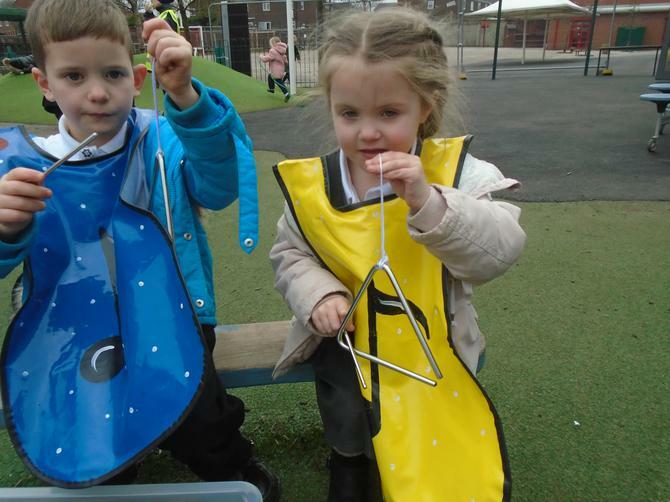 KS1 children build on these skills with curriculum led music teaching and learning which offers many opportunities for cross-curricular links, for example; English and Stories, Geography and the Weather and Science and Our Bodies and others. Our Year 2 children are introduced to their first instrument tuition at school with class lessons on the Ocarina taking their first steps to understanding notation and reading music. Building on skills from previous learning, KS2 children learn to play the recorder then move onto brass and woodwind instruments. Classes that do not learn an instrument are in receipt of teaching and learning that follows The National Curriculum objectives. This involves preparing for school performances and assemblies and building on listening and appraising skills through a broad range of genres. Northcote offers children the opportunity to sing in a choir after school in two age groups: for younger children Years 2 to 3 and for older children Years 4 to 6. There is also an extra-curricular club that allows children additional tuition with brass instruments. In addition children from years 1-6 can dance to contemporary music in our after school dance club. Children from Years 2 to 4 have visited the Royal Liverpool Philharmonic to enjoy their fabulous schools’ concerts and having seen and heard the magnificence of their full orchestra, raise the aspirations of our budding musicians. We are always looking for opportunities for our children to perform having sang at the Manchester Arena, LFC and St. Georges Hall we appreciate the value of these experiences for our children not only in terms of making special memories but essentially to build performance skills and confidence. Our school works in collaboration with 6 other local schools; here the subject leaders meet and discuss aspects of the music curriculum, sharing good practice and ideas for purposeful teaching and learning. Impact – The children’s aptitudes and talents are nurtured from EYFS to the end of KS2 through musical activities including singing, listening and appraising and performing and sharing. Our approach is a mixture of developing musicality through curriculum coverage and the introduction of instrument tuition to develop skills in all the elements of music. As the children develop their knowledge and skills throughout the key stages their performances in and outside of school grow in maturity and confidence. This is reflected in our termly assessment data as teachers see their students’ progress within a year and, in the long-term, throughout a key stage. Class teachers collect video and photographic evidence to help inform the monitoring process and children from Year 1 to 6 complete ‘I can’ statements to help inform future planning. Subject and school leaders monitor the impact of our curriculum provision through completing regular monitoring, that includes listening to the voice of our children. 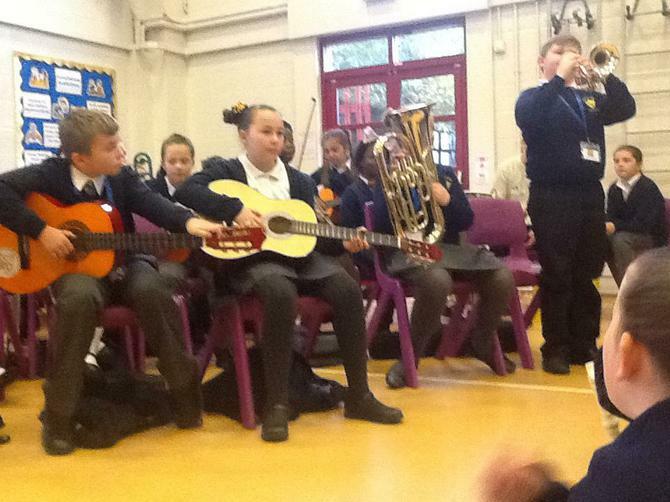 Our musicians performing at a celebration assembly. Thank you to all our musicians and singers for a performance enjoyed by parents and pupils. Take a listen to our wonderful choir and their two part harmonies. 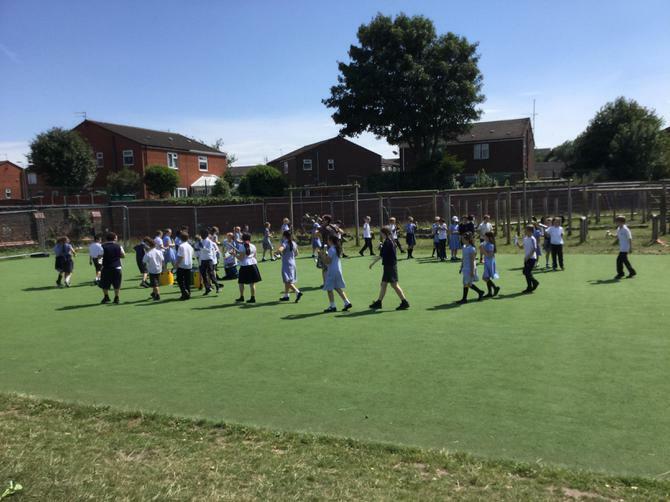 Here are Year 5 enjoying playing samba in the sunshine. The samba players are warming-up. 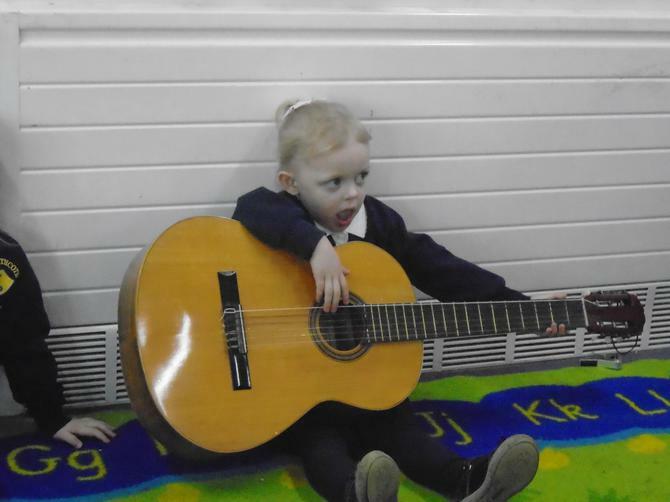 Nursery children exploring the wonders of the guitar. EYFS can choose to create their own sounds during outdoor provision. On Thursday 3rd March the Northcote School Choir joined over 8,000 other children from all over the North West of England to sing in the Young Voices Concert in Manchester Arena. What a fantastic day. 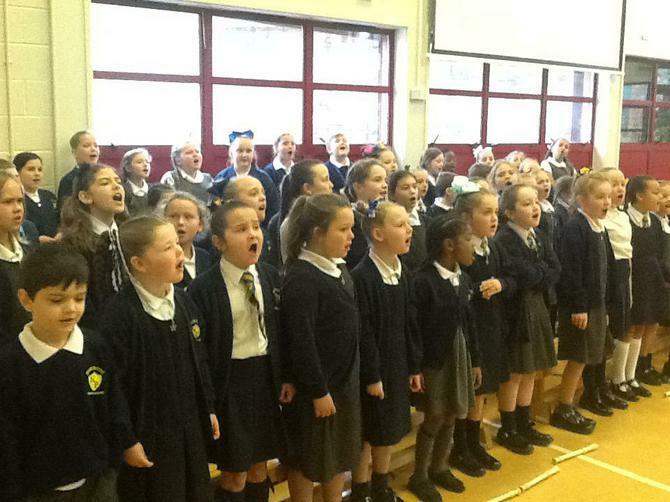 Take a look at our wonderful choir at the M.E.N. Arena. Wow! What a terrific sound was made by more than 7000 children.